The Streak continues in Rosemont, Illinois as The Undertaker tries for victory number six and for the WWF World Heavyweight Championship. On this night in the Rosemont Horizon Arena, The Deadman squares off against Sid Vicious at Wrestlemania 13. The feud would begin at In Your House, the intertwined feuds of Stone Cold and Bret Hart combined with Psycho Sid and The Undertaker started with a Four Corners elimination match that Hart would win. Due to various opportunities and interference in matches from Austin and The Undertaker, Sid Vicious would walk in Mania with the title and defend it against The Undertaker while Hart and Austin would settle their own differences earlier in the night. On this same night, Stone Cold Steve Austin would cement his place in wrestling history and on this same night, The Undertaker would capture the WWF Championship as well as his sixth victory at Wrestlemania. The Rosemont crowd had already seen a historic night, but it wasn’t complete without the WWF Championship match. This match would surprisingly start off with Mr. Wrestlemania Shawn Michaels. The Heartbreak Kid wouldn’t be there to wrestle, but he would be live on commentary for the championship match. As HBK watched the main event, The Undertaker’s gong was heard throughout the arena. It was only a matter of time until Psycho Sid entered the ring and the match began. The two men began with a stare down, but Bret Hart had other plans. He came down to point the finger at everyone which includes Shawn Michaels. The Hitman hadn’t gotten enough from Stone Cold on this night. He wanted to make sure that everyone knew that he was coming for the Championship regardless of the winner, but Sid dropped him with a giant powerbomb to set the tone. The Undertaker decided the time for talk was over and went to work on Sid. The Deadman went on a binge of offense and it eventually led to some Old School. Sid applied a big bearhug to slow him down. The bearhug was very successful in grounding The Phenom and Sid went to work on the lower back. Shawn Michaels asked if you could squeeze the life out of The Undertaker. Psycho Sid decided to start working him The Deadman on the outside by pushing him over and then trying to push him through the French announce table. I don’t know what it is about guys trying to destroy the foreign announce tables, but it was enough for Vicious to control the match and bring The Undertaker back into the ring to continue the pounding. Vicious would use a big powerslam, a huge legdrop and others. The Undertaker would break the momentum momentarily with a flying lariat, but Sid would continue to apply pressure. Eventually the two found themselves on the outside again. The two would trade bombs on the outside and Taker would use the steel steps to gain control. He missed an elbow and Sid would regain control again. 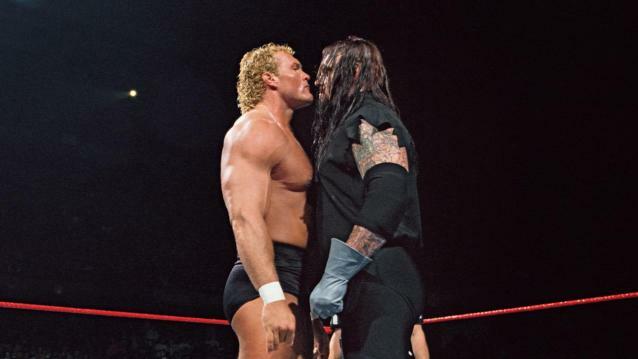 Sid Vicious has been in command since the beginning, but The Undertaker would gain some spurts of offense that were high impact and were used to wear down the champion. A double boot would put each man down again as the two men entered into a stalemate halfway through the match. Sid’s gameplan was working to a tee. It wasn’t fancy, but it was effective. He was big enough to handle The Deadman and he wasn’t going to be overconfident like Big Daddy Cool Diesel, or The Heartbreak Kid on commentary. You can feel Sid thinking about the end with a powerbomb. The match would change when The Undertaker caught Sid on the top rope, threw him onto the mat and landed a big clothesline. The Undertaker was going for the kill with the Tombstone, but Psycho Sid revered it into a Tombstone Piledriver of his own. Vicious had the match won as he crossed the arms of The Deadman for the 1-2 and miraculously, The Undertaker kicked out. The two men fought to the outside as Bret Hart would return with a steel chair on the back of Vicious. The tide had turned as The Undertaker landed a huge chokeslam, but it wasn’t enough to put Sid down for good. Sid ducked a flying clothesline and went for a powerbomb, but Bret Hart was going to get the last word and he fought Sid on the apron and guillotined him on the ropes. It was enough as The Deadman was waiting. He picked up Sid Vicious for the Tombstone Piledriver and for the 1-2-3. The Undertaker had captured the WWF World Heavyweight Championship and his sixth victory at Wrestlemania XIII. This was a good match, a very good match to watch. It wasn’t slow, it moved consistently and the only flaw I saw with it was the continued involvement of Bret Hart. I understand the storyline, but if Bret Hart came out at the beginning and at the end, it would have been fine, but the chair shots were a little much. It made The Undertaker look like the opportunist rather than the better man in the fight. Sid was in control for eight-five percent of this match. He even landed a Tombstone on The Undertaker which was awesome. I think the crowd was a little exhausted from the night because that kickout was a great moment and it should have gotten a bigger response in my opinion. The Tombstone continues to be a one shot one kill move at Wrestlemania. I honestly keep forgetting how devastating it is until Taker hits it again. The move is going to be even more important as we move on. It was a nice moment to watch The Undertaker capture the championship to close out Mania XIII. 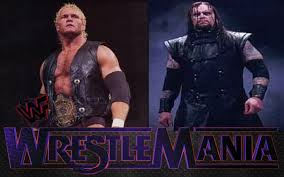 The way I see it, this was the marquee match of the card and of Undertaker’s career. So far, The Streak has had some nice matches and a few good stories. This match may not have had a great story, but it was for the title and that is enough to make me care about it. What gets me is this is the first time The Undertaker has been absolutely front and center during his Wrestlemania match. The Streak went up another level in my opinion because it now carries a title win as well as even bigger names. Having Shawn Michaels on commentary made it feel even bigger for me. It is going to be a nice addition to see what The Streak does next because the matches are becoming far more consistent and even if the story isn’t as huge as it has been or will be, The Streak is starting to carry weight and it feels bigger because when the bell tolls for someone like Sid Vicious, I wonder if they can conquer The Deadman.